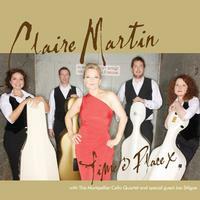 Time and Place perfectly sums up Claire Martin's jazz roots beginnings and the inventive, forward-thinking repertoire choices that have framed her career. The majority of arrangements found on this Multi-channel SACD feature the Montpellier Cello Quartet with whom Claire has developed a unique partnership since they first performed together in 2012. Together Claire and the quartet create a sound fusion of jazz-chamber music that encompasses new arrangements from an eclectic group of songwriters including Lennon & McCartney, George Gershwin, David Bowie and Thelonious Monk. Claire has commissioned imaginative new arrangements, including Joni Mitchell's "Two Grey Rooms" by Mark Anthony Turnage. Pianist Joe Stilgoe guests on his own track "Lost for Words" and delivers a distinctive arrangement of Lennon & McCartney's "She's Leaving Home". There are echoes of The Beatles' "Eleanor Rigby" on a new arrangement of David Bowie's "The Man Who Sold the World". Claire's long-time partnership with Richard Rodney Bennett is acknowledged with both songwriting and arranging credits. "Early To Bed" is quintessential Bennett, and Claire gives a heartfelt performance. "Time and Place" sees Martin return with renewed vigor to pop-crossover territory. This Hybrid SACD plays in both CD and SACD players, as well as all SACD-compatible DVD players.